» Will ‘scenic’ label ruin Highway 34? Will ‘scenic’ label ruin Highway 34? Driving on the Alsea Highway through the Coast Range is a blast — especially when there’s no one else on the road except some vultures having a roadkill snack. So why did ODOT have to spoil it, maybe, by calling it a “scenic byway”? The Oregon transportation department made the announcement last week. There are now 29 designated scenic byways. 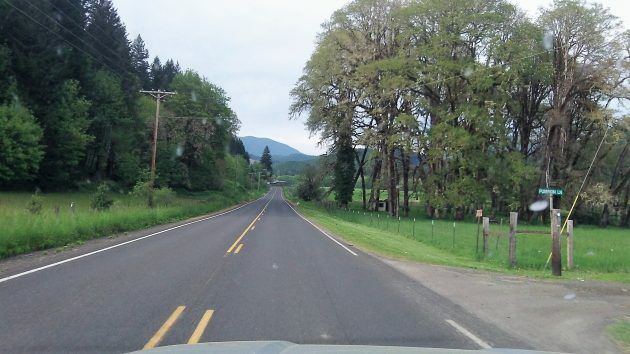 And the road between Waldport and Philomath, something like 60 miles long, with spurs to Marys Peak and Alsea Falls, is one of them. The idea is to encourage tourists. Which is just great. As if on summer weekends we don’t have enough people in RVs moseying along at 40 miles an hour gawking at the scenery. As if there weren’t enough people unfamiliar with the route and standing on their brakes at every slight turn in the road. Highway 34 outside Alsea was blessedly devoid of traffic on Saturday evening. I avoid scenic byways on the MH because they’re not built to handle that size. Park at a campground and tour in the car. It might be nice to know if any measurements (before/after) have been made on any of the “scenic byway” roads that show they have actually resulted in large jumps in traffic solely because of the designation? I’m an Oregonian….born here many years ago. Last time I remember taking the Philomath to Walport route, it had hairpin curves…worse than the ones on Highway 20, before update, to Newport. Thanks for the video of your trip, Hasso; I’ll now be a non-tourist native on the Philomath to Walport route if I go to the coast. So, I think your video has backfired, as it is very appealing so more of us will use that route. But, I do not have a motor home; there’s at least that. I remember those hairpin curves also. When I was learning to drive, too long ago to disclose, my dad had me drive out Highway 34 and actually had me tackle the hairpin curves. I must say it was a hair-raising experience, especially going down hill. After several times driving those curves, I had much more confidence navigating difficult driving. Everything I found says the “scenic” designation goes all the way to I-5 on Highway 34. If that’s so, tourists will get off the freeway at Tangent, drive a few miles west, turn around and continue on to Washington or California. Problem solved. I just got back from 3 day trip to coast and loved it. I went from Albany to Florence, up to Astoria and back. Took a few scenic hwy but didn’t see much traffic on either road. I traveled mostly hwy 101. but cut off wherever I could to get closer to ocean. The traffic was mostly in towns where something was going on or a nice beach area. We followed some slower RV’s but they usually pulled over when they could. Considering what they pay for license fees and gas they own the road as much as we do. I try not to be in hurry when I travel because that just causes problems all around. I rarely travel hwy 34 because of curves which I saw a bad wreck there once. All I can say is be careful there are some crazy people driving out there. I drive this road everyday from Waldport to Philomath. Encouraging people to travel this is the worst decision anyone has ever made especially pulling any kind of trailer. The road is not wide enough and the hairpin curves are terrible. Why would you encourage heavy traffic on a road like this that takes Emergency Personnel a very long time to reach? There are already a bunch of non driving SOBs on that road. I like the way they post the straight portion of this road and not the hairpin curves. How misleading. The problem is not labeling a very scenic route as scenic, the root problem is that there are too many people in Oregon. Yet there is no serious discussion about bringing the population under control. Spot on, dude! The planet’s population, at 7.5 billion, is likely 6.5 billion more than the planet can safely absorb, given the level of ignorance and disdain demonstrated by Homo Sapiens. A global One-Child policy (whether you’re married or not) [includes males] in force for a few decades ought to solve the problem. Travel Oregon and ODOT taking a victory lap on what is mostly a non event. Nothing better than taking a drive on one of our coastal routes. My favorite is Hwy 38 through Elkton and Drain and the Umpqua River.